U.S. And Russia Form A Plan On Syria's Chemical Weapons : The Two-Way In a plan announced Saturday, the U.S. and Russia would give Syria a week to detail its chemical weapons arsenal. Secretary of State John Kerry and his Russian counterpart reached the deal on the third day of talks in Geneva. Secretary of State John Kerry and Russian Foreign Minister Sergei Lavrov announced a plan to eliminate Syria's chemical weapons arsenal from Geneva on Saturday. Secretary of State John Kerry and his Russian counterpart have reached a deal that calls for Syria to destroy all of its chemical weapons. The plan, which Kerry announced in a news conference with Russian Foreign Minister Sergei Lavrov in Geneva on Saturday, gives Syria a week to detail its chemical arsenal. "The world will now expect the Assad regime to live up to its public commitments," Kerry said. "And as I said at the outset of these negotiations, there can be no games, no room for avoidance, or anything less than full compliance by the Assad regime." 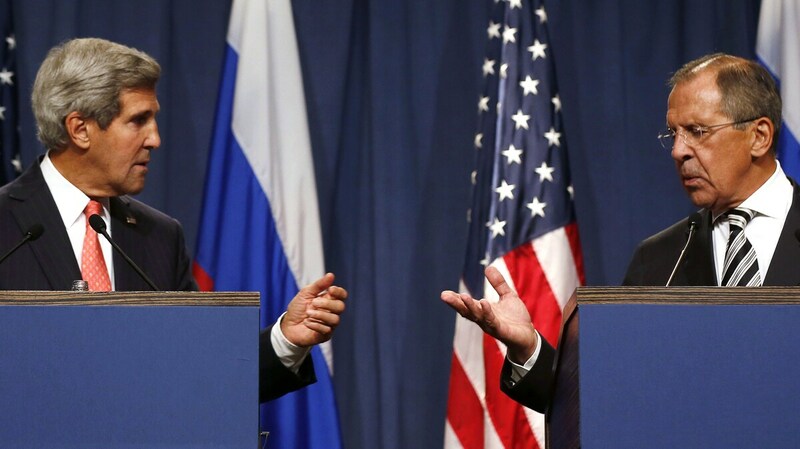 The apparent breakthrough comes on the third day of talks between Kerry and Lavrov, which began in Geneva on Thursday. It includes a contingency plan to authorize sanctions on Syria if President Bashar al-Assad does not comply with the deal's requirements that it list, and then destroy, its complete stockpile of chemical weapons. Syria would have until the middle of 2014 to finish destroying all of the weapons, Kerry said. He said that international inspectors must be given"immediate and unfettered"access to the arsenal by November. "I spoke to Secretary Kerry earlier today and thanked him for his tireless and effective efforts on behalf of our nation," President Obama said, in a statement welcoming the news of a draft agreement. "I also spoke to Ambassador Samantha Power who will ably lead our follow-on negotiations at the UN Security Council in New York." The president concluded his message by saying, "The use of chemical weapons anywhere in the world is an affront to human dignity and a threat to the security of people everywhere. We have a duty to preserve a world free from the fear of chemical weapons for our children. Today marks an important step towards achieving this goal." The State Department has posted an outline of the joint U.S.-Russian plan, which it says will be submitted to the Organization for the Prohibition of Chemical Weapons. The document details how Syria should comply with the agreement, and how the country's chemical weapons would be destroyed. The outline calls for "Destruction of production and mixing/filling equipment by November." Chemical weapons inspectors are expected to brief senior U.N. officials this weekend about their report on an Aug. 21 chemical attack that left more than 1,000 Syrian citizens dead. "I believe that the report will be an overwhelming, overwhelming report that chemical weapons (were) used, even though I cannot publicly say at this time before I receive this report," U.N. Secretary-General Ban Ki-Moon said during a U.N. meeting Friday, Reuters reports. Many of the U.N. inspection team's conclusions might be made public Monday, after Ban briefs the Security Council, the AP says. Sweden's Ake Sellstrom, who leads the team, told the new agency that he is presenting his findings to Ban this weekend. Any possible sanctions on Syria would stem from a U.N. Security Council "Chapter 7" resolution, meaning that they could include military or non-military measures. Chapter 7 of the U.N. charter deals with preserving international peace and security. "Any violations ... would be looked at by the Security Council, and if they are approved, the Security Council would take the required measures — concrete measures," Lavrov said. "Nothing is said about the use of force or about any automatic sanctions. All violations should be approved by the Security Council." The Syrian government has denied that it deployed chemical weapons against its own citizens; it had not publicly acknowledged its chemical stockpile until Tuesday, when it promised to open storage sites to inspectors. As The Washington Post reports, "Assad sent a letter Thursday to U.N. Secretary General Ban Ki-moon saying that on Monday he will sign the international accord banning chemical weapons." Kerry says that the efforts to eliminate Syria's chemical weapons holdings are directly linked to the push for peace talks to end the country's civil war, which has killed thousands since it began more than two years ago.